9.75" x 31" 15.25" Wheel Base 7" Tail, 4.5" Nose Double Kick, Concave New, modern updated concave!!! 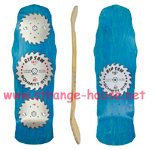 Schmitt Stix Rip Saw - Blue - Modern Concave!!! 10.125" x 31.25" 15.5" Wheel Base 6.625" Tail, 4.325" Nose Double Kick, Concave Will start shipping on or about 9/18/14. 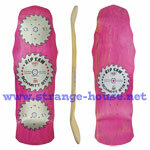 Schmitt Stix Rip Saw - Pink Stain - Modern Concave!! !